*Appetizers and refreshments will only be served in our Costa Mesa store on 6/29/17 and in our Long Beach store on 6/30/17. Appetizers and refreshments include wine, champagne, soft drinks, cheese platters, and snacks. **Prizes include discounts and Lucky Feet Shoes gift cards, which will be given out throughout June 28th to July 2nd, 2017. Come into any one of our stores, located in Anaheim Hills, Costa Mesa, Long Beach, Rancho Cucamonga, Riverside, San Dimas, Temecula, La Quinta and Palm Desert! Visit us today and try on a pair of comfort shoes! 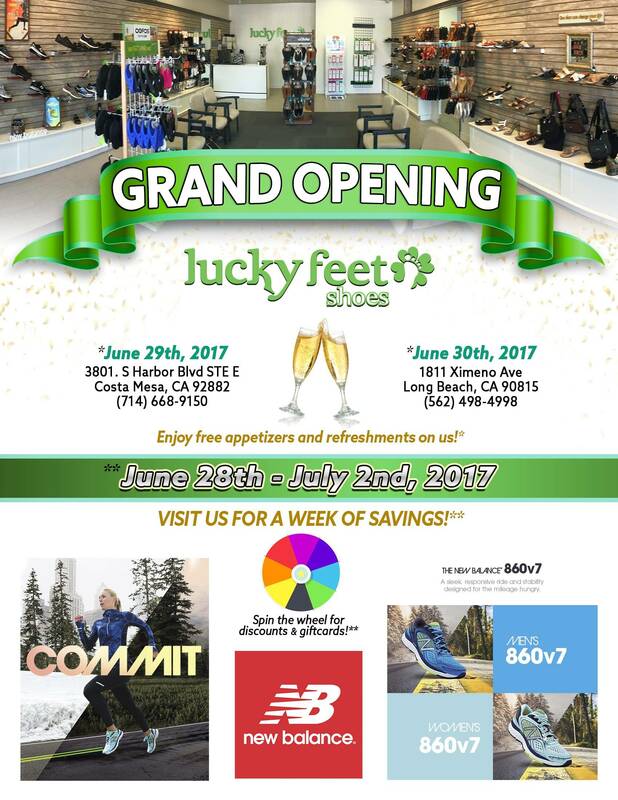 At Lucky Feet Shoes, we carry many comfort shoes: sandals, sneakers, running shoes, walking shoes, heels, wedges, booties, and slippers; in any of our Southern California stores. If you are looking for comfort footwear in Orange County, the Inland Empire, Los Angeles County, Temecula or Riverside; we have nine stores to serve you! Come and visit us today! If you are looking for comfort shoes or wide shoes in Anaheim, Anaheim Hills, Yorba Linda, Brea, Orange, Placentia, Costa Mesa, Santa Ana, Fullerton, Irvine, Villa Park or Tustin; then visit our store in Anaheim Hills or Costa Mesa. If you are looking for comfort shoes or wide shoes in San Dimas, Glendora, Pomona, Covina, West Covina, La Verne, Azusa, Cerritos, Lakewood, Cypress, Carson, Wilmington, Seal Beach, Diamond Bar or Claremont; then visit our store in San Dimas or Long Beach. If you are looking for comfort shoes or wide shoes in Rancho Cucamonga, Ontario, Upland, Fontana, Rialto, Chino, Chino Hills, Mira Loma, Eastvale, Colton or San Bernardino; then visit our store in Rancho Cucamonga. If you are looking for comfort shoes or wide shoes in Riverside, Moreno Valley, Corona, Rubidoux, Loma Linda, Grand Terrace, Redlands or Norco; then visit our store in Riverside. If you are looking for comfort shoes or wide shoes in the Temecula Valley, Murrieta, Fallbrook, Lake Elsinore, Wildomar, Hemet, San Jacinto, Pala, Sun City, Menifee, Canyon Lake, Perris, Bonsall or Anza; then visit our store in Temecula. If you are looking for comfort shoes or wide shoes in Indio, Coachella, Thermal, Vista Santa Rosa, Valerie; then visit our store in La Quinta. If you are looking for comfort shoes or wide shoes in Cathedral City, Thousand Palms, Palm Desert, Palm Springs, Desert Springs, Rancho Mirage or Bermuda Dunes; then visit our store in Palm Desert. Click here for all store locations. For more information call: 1-877-220-4606.